What is the ICD-10 Code for Arthrogryposis? The ICD-10 Code for arthrogryposis is Q74.3. Q74.3 is a billable/specific ICD-10-CM code that can be used to indicate a diagnosis for reimbursement purposes. The 2018 edition of ICD-10-CM Q74.3 became effective on October 1, 2017. This is the American ICD-10-CM version of Q74.3 - other international versions of ICD-10 Q74.3 may differ. ICD-9-CM 728.3 is a billable medical code that can be used to indicate a diagnosis on a reimbursement claim, however, 728.3 should only be used for claims with a date of service on or before September 30, 2015. For claims with a date of service on or after October 1, 2015, use an equivalent ICD-10-CM code (or codes). Arthrogryposis multiplex congenital (AMC) is the congenital joint contracture in two or more areas of the body. “Arthrogryposis” comes from Greek, meaning "curving of joints." Children born with joint contractures have abnormal fibrosis of the muscle tissue, causing muscle shortening, and are unable to perform active extension and flexion in the affected joint or joints. Arthrogryposis is divided into three groups: amyoplasia, distal arthrogryposis, and syndromic. Amyoplasia is characterized by severe joint contractures and muscle weakness. Distal arthrogryposis mainly involves the hands and feet. Neurological or muscle disease forms of arthrogryposis are in the syndromic group. 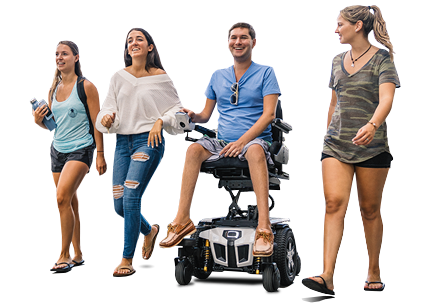 Quantum Rehab, the global leader in clinically-based, user-inspired power wheelchairs, offers technologically-advanced models specifically meeting ICD Codes for Arthrogryposis, including ICD-10 Q74.3. For more information, please click here.